One of the latest features on the Juniper MX-series devices is the BRAS functionality. The first functionality (automatically configuring interfaces) has been available since a long time, but most BRAS features have been introduced last year in JUNOS 11.x releases. With JUNOS 11.4 (also a Long-Term-Support release) the features matured as all major components are now available and (fingers crossed) stable. This functionality can be named in different ways. BRAS or Broadband Remote Access Server is the most common name. Other names are Broadband Network Gateway (BNG) or Broadband Service Router (BSR). This functionality is used in Internet Service Provider environments usually where DSL or Cable is used as the last mile access. The following drawing demonstrates how the end-to-end path looks and where a BRAS/BSR is placed. The CPE (DSL/Cable modem) is connected to the Multi-Service Access Node (MSAN), this MSAN is either a DSLAM in case of DSL networks or a CMTS in case of Cable networks. The DSLAM and CMTS devices convert the signal to Ethernet (or any other transport) and forward it to the rest of the network. This connection is then terminated on a BRAS device before it enters the rest of the network (and the internet). The BRAS is used for 2 reasons. The first is for authenticating the client if it has the right to enter the network. Second is to enforce the subscription in terms of bandwidth limits and services that the client bought. In the more classical model, when ATM was mostly used as transport layer, the identification of subscribers (as how clients are called on BRAS devices) where identified using PPP sessions. A client or CPE device initiates a PPP session. This ensures for encapsulation between client and BRAS and ensures some sort of circuit where you can apply authentication and enforce traffic control polices. Authentication of the client is very easy from the service provider standpoint, as a user has a username and password, which it needs to enter before getting authorized to the network. This is a little more hassle for the user as they need to know these values and have knowledge how to configure a ppp session, either on the CPE (modem) or on end-hosts. The more modern/current approach to BRAS deployments is first of all using Ethernet as the transport layer for the usual reasons that Ethernet is very cheap and offers a lot of flexibility and now with the OAM features as 802.1ag it’s becoming very mature to use as carrier transport layer. Together with using Ethernet more flexible options become available as Ethernet utilizes the DHCP protocol for address assignments. This enables a very dynamic approach to enabling users on the network, but requires some administration by the ISP. Traffic separation on Ethernet is ensured using IEEE 802.1Q based VLAN tags. This is done in 2 ways. Either using a single VLAN (per PoP or per service), which is called the S-VLAN model, or by using a separate VLAN for every customer (C-VLAN). In the C-VLAN model there are usually 2 tags stacked on each other as 4000 VLAN numbers is not enough for service provider scaling, so an additional tag is stacked which gives 4000×4000=16.000.000 combinations. Which should be more than enough for a single interface. This means that these models are not strictly compliant to any MEF or IEEE standard. It’s just terminology used in the BNG deployments. CPE MAC addresses are registered with back office systems of the ISP. The tagged packet is received by the BRAS and depending on the VLAN tag combination a sub-interface (unit / IFL) is created dynamically according to pre-defined variables. 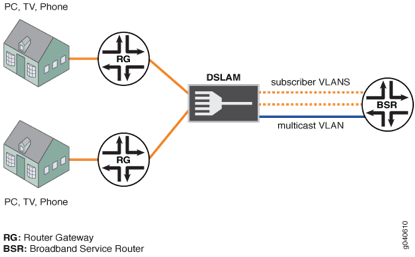 In case of the S-VLAN model, there are still multiple subscribers sharing the same sub-interface, which limits the possibilities for configuration. Another sub-interface per subscriber is necessary. This will be based on the source IP address. This process is called ‘demux’ and uses the virtual demux0 interface within JUNOS. Within this process another sub-interface is created on top of the demux0 interface, which now ensures enough uniqueness. After the customer uniqueness is ensured the BRAS picks up the DHCP message and processes all possible options (within option 60 or 82, several properties can be set on which the MX can act). After authentication the AAA server responds with several attributes that fill in the variables of the configuration of the sub-interface. After the sub-interface is created the DHCP process is finalized using a DHCP Offer, Request, Accept and the client can access the network! This was to give you a brief introduction into the BRAS functionality now with the widely deployed DHCP model. The main functionality that is now available to enable all this on the MX is the auto-configuration of sub-interfaces and the use of variables that can be filled in using RADIUS attributes. During JUNOS 11.x releases the functionality matures and important things like GRES (supporting routing engine fail-overs) and versioning (changing profile configuration while subscribers are using that profile) became available and as of JUNOS 11.4 all major features are implemented. Please be aware of the platform that you choose to run the BRAS functionality on. As all the auto-configuration is performed on the routing-engine a fast RE is recommended! The new quad-core (RE-S-1800×4) routing-engine delivers blazing fast performance and enormous scaling in terms of IFLs (units / logical interfaces). When you want to deliver correct Class of Service for thousands of subscribers using a model for having various queues ensuring correct prioritization of voice/video traffic and shaping according to the bandwidth plan the customer bought you will need a feature called H-QoS (H for Hierarchical). The per VLAN/subscriber scheduling and shaping is only available on the Q or EQ line cards on the MX platform. If you only want to use VLAN policing than you are good with a standard Trio/Cassis-based line card. Within this model, you assume no control over the MSAN (CMTS or DSLAM), so to control the uplink bandwidth of the user you need input shapers to slow down the incoming traffic. With the Q and EQ linecards this is also possible as the queues can be distributed across both input and output traffic. To ensure correct scheduling for voice and video traffic the BRAS expects traffic to be marked with the correct DSCP and/or IP Precedence bits. I hope you enjoyed my blog, please leave a comment if you have questions. Your missing qos on the first mile! With a bandwidth managed after the CMTS, upstream, it is not possible to control the allowed uplink BW. Also downstream the CMTS should create Service flows for high qos traffic, which is not possible in your setup. If the control-plane of the CMTS and the BRAS are connected then you can intelligently control BW on the CMTS docsis level. You are also right about the upstream bandwidth, this can be solved by using input shapers on the MX, which is also possible with the Q and EQ linecards. Queues can be distributed between input and output, so shapers are available in both directions. For this particular case I didn’t have to limit any upstream bandwidth as all packages offer the maximum upload that is available on the network. Also for this case the ISP uses a wholesale model from another ISP so they have no control over the DSLAMs. As for high QoS traffic, you are right that this should be done by either the MSAN or the modem itself. Either way the BRAS just expects DSCP marked traffic. Again thanks for your comment and I updated the post to correct this. great blog, please describe the junos version to support bras in mx series. Currently the recommended JUNOS version is JUNOS 11.4R5 (just released). However, when you run into issues, JTAC will supply you with a special BRAS release which is JUNOS 11.4X27. This is the recommended BRAS release when you might run into issues with the current software. I would recommend using a regular ‘R’ release, until you need a JTAC case. Then the upgrade to X27 will happen. The X27 release is expected to be merged with the regular releases somewhere end of this year. Hi. Yes that’s the one I meant. JUNOS releases are always 11.4R5. (x) so any R5.x release is good. The X stands for the build number. From the topology above, Is it possible to implement? The topology is definitely good! Try it with DHCP first, this is usually a lot simpler than PPPoE, but it should definitely work! Please use JUNOS 11.4 (latest R) when testing BNG features on MX. You are in point of fact a good webmaster. The web site loading pace is amazing. It kind of feels that you’re doing any unique trick. Moreover, The contents are masterwork. you have done a great job in this topic! It is a great function of the Juniper products.You have described it in great detail. Thank you, I have now understood some additional things about BRAS and JUNOS. Hi, It’s really great blog! I am going to do some research on BNG and doing little homework. Your blog is indeed a great help to cross check whether I have understood everything from TR-101 properly. Nice blog, please keep it up. Thanks a lot ! 802.1ah is provider backbone bridging. 802.1ag is Ethernet OAM/CFM. 802.1ad – QinQ – specifies the S-Tag while the inner C-Tag is 802.1Q. I have no certifications, but would expect someone with the credentials you have to not just throw specifications around – this confuses people. Thanks for your feedback. You are correct about the ah versus ag error. Missed that one! About the tags I don’t see an error in the blog. It’s still valid that the S-VLAN model used in BRAS deployments has a single tag versus 2 tags on the C-VLAN model, where every customer has it’s own tag within an S-VLAN (per service). I will rephrase the paragraph as I think it’s not very clear what I mean there. I am currently testing MX as Bras , can you help me with a fast configuration guide ? to find somebody with some original thoughts on this subject. Can you please refer some good documentation for MX-80 as a BRAS? Using both PPPoE & VLAN based subscribers. Can I configure MX-80 for GPON network using ppoe and IPoe authenication. I area all the isps using GPON/EPON with PPOe authentication. Currenlty they are not using any routers. All are using inline servers fr user management. nice post! thanks for sharing. I have a little query regarding MX BNG.